Combine a small red balloon heart with delicate 'Marabou' feathers, attach it to a stick and a heart shaped balloon stand - and you'll have not only a beautiful table decoration, but also an elegant name card holder. Ready to start? 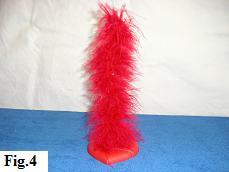 First, take you balloon stick and cut it to about 15 cm length. 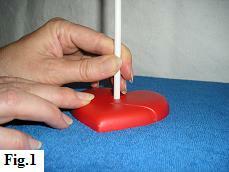 Then place it into the hole in the middle of your heart shaped balloon stand (fig. 1). Next, cut a small piece of the double sided sticky tape and attach it to the bottom of the stick (fig. 2). 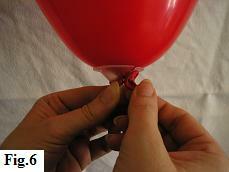 Attach another piece to the middle and to the top of your balloon stick. Now take your string of 'Marabou' feathers and, starting at the bottom of the stick, begin winding it round in a fairly tight spiral until you reach the top (fig. 3). 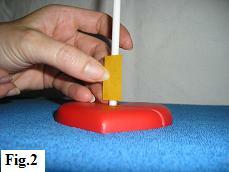 Once finished, the balloon stick should be completely invisible (fig. 4). 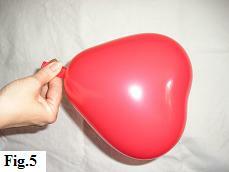 The next thing to do is to blow up your heart balloon (fig. 5) and attach it to the cup holder, as explained on our "Tips and Tricks" (opens new window) page. 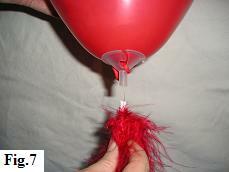 When you're done, the balloon will be attached neatly to the cup (fig. 6). Almost finished! 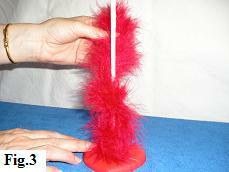 Gently fix the stem of the cup to the balloon stick (fig. 7). 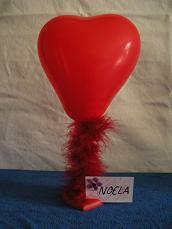 Then place a name card in the slot provided on the heart shaped balloon stand. And there you have it ... an elegant table decoration that serves also as a place setting name card holder. Special Tip: This table decoration goes well with a floating heart bouquet, for example with our 'Valentine's Balloon Bouquet'.